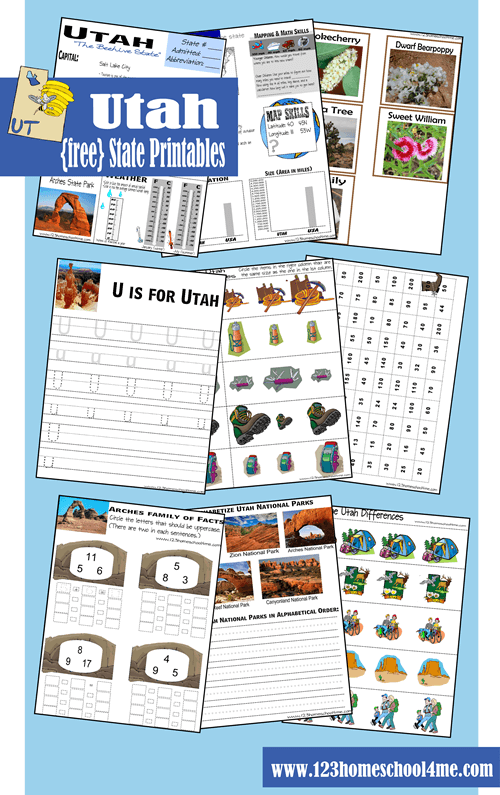 Next state for our homeschool social studies unit studying the United States of America is Utah, Don’t miss all our free state worksheets from our US States for Kids unit. Studying the US States is a great way to get to know our great country, meet famous Americans, learn about natural habitats & their animals, famous landmarks, history, and have LOTS of fun!! I am thrilled that my Preschooler & 1st grader can learn side-by-side! The packs have lots of activities suitable for kids Preschool – 5th+ grade! Did I mention it is FREE!! Where is the state in the US? OTHER – You will find about 20 sheets of other activities. These will incorporate educational skills with facts about the state. For example you may use a measure to see how tall the Missouri Gateway Arch is compared to the Willis Tower. Or you may learn skip counting with the Wright brothers. Play a KFC Chicken Sight Reading Game when learning about Kentucky or roll your Way through the Indianapolis Speedway. Learn about Nocturnal animals and coal. Or build a shape car while learning about Michigan’s Henry Ford. Each pack is different in this area – so browse for the activities that fit your child’s needs, interests, and skills. Reflecting: Where are my treasures? The BEST Pinterest Boards for every Subject!